Taurus Hill Observatory | Exoplanet KOI 256b observed at Taurus Hill Observatory. Posted May 2nd, 2011 by Harri Haukka & filed under Extrasolar Planets, Highlights. The bright spring sky makes the light curve measuremets quite challenging. 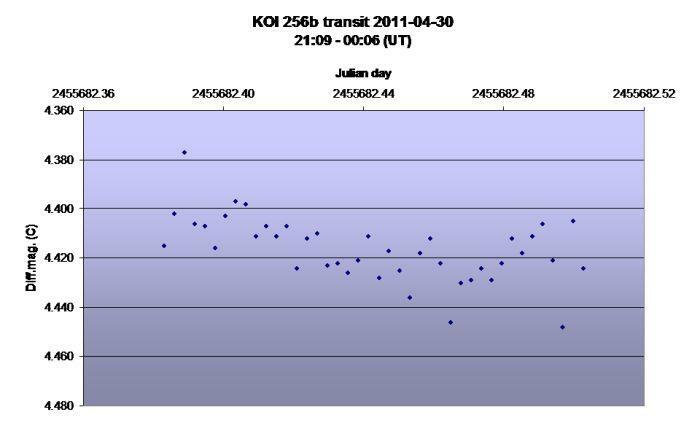 Despite this the Taurus Hill Observatory research team managed to observe and measure the transit of the exoplanet KOI 256b 30.4.2011. KOI 256b is located in Draco and it has been discovered by Kepler-telescope. KOI 256b is still in the list of unconfirmed discoveries. According the THO mearurements the duration of the transit was 85.1 minutes and the dimmening of the mother star 12.1 mmag. This observation has been published in TRESCA database. (CREDIT TRESCA: http://var2.astro.cz/EN/tresca/transit-detail.php?id=1304215870 ).